Revealed! 2017 Best Baby Car Seats Are Here! Welcome to ShopBabyBrands 2019 rankings of convertible car seats. You're more familiar with car seats by now as you've probably already used an infant car seat and your baby is beginning to outgrow that so you're looking for a new car seat. Or you're thinking more ahead and want to save some money and go straight to a convertible car seat (some can be used from birth). Convertible car seats are different than infant car seats as there's many more features to consider. The main difference is that you'll no longer be able to remove the car seat with your baby in it. So please take your time and look at what we think are the top car seats for 2019! 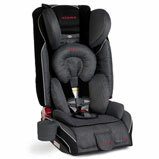 The #1 rated convertible car seat has all the standard features and more that you would expect from Britax. 3 layers of side protection along with their ClickTight Installation System will make installing a breeze and give you peace of mind about the safety of your child. The easy to adjust harness grows along with your child with 14 different positions. The NextFit convertible car seat is the next step after the #1 rated Chicco KeyFit infant car seat (that's our #1 choice for infant car seat). 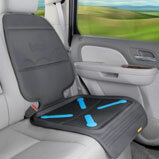 It's one of the easiest car seats to install and their exclusive Recline Sure 9-position leveling system provides the most recline positions to fit any type of vehicle. Just like the Keyfit, it has two Ride Right bubble levels to indicate correct positioning. 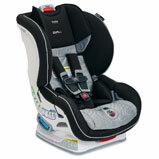 The Britax Boulevard (BLVD) ClickTight car seat includes the patented ClickTight Installation System. Other safety features include an extra layer of side impact protection, a “click & safe” snug harness indicator, a steel frame and an impact absorbing base. Because most car seats (up to 75%) are installed incorrectly, the ClickTight system insures that your baby is safely in their car seat. It’s literally quite the safest and easiest car seat to use in today’s market. 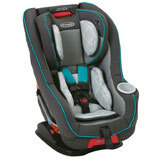 The EvenFlo Tribute LX is one of the more popular baby car seats. 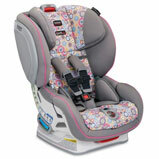 It has an upfront harness adjustment, rear-facing recline and a 4 point harness for comfort. The pads on the car seat are machine washable too. Design to be compact and light, it's a great choice for parents switching between multiple cars. Parents always forget that you also need to protect the interior of your car. Not only from spills and food, but also damage from the car seat itself. These car seats are heavy (30lbs+) and because of the way you're anchored down, it causes indention and marks to your seat itself. You won't notice or realize the damage until you remove the car seat. Thus to prevent such damage, we HIGHLY RECOMMEND that you purchase the Brica Seat Guardian. The Graco Size4Me 65 features a RapidRemove cover which lets your clean the covers without having to remove the car seat. It has a one-hand harness and headrest adjustment. The FussFree harness system keeps the buckle out of the way until you are ready to use it. 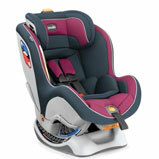 It has a 3-position recline and a 5 point harness for additional safety. 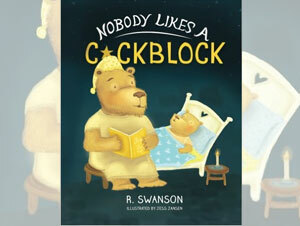 It's comfortable for your baby and you. 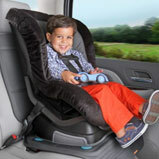 The Radian RXT is a versatile car seat that can seat children from 5 to 45 pounds (rear) and 20-80lbs for front facing. Comes with a 5 point harness and can then convert into a booster for children up to 120lbs. It has a steel alloy frame and their patented SafeStop energy absorbing harness. One cup holder with up to 4 cup holders total. It sits low for easy access and extra side and longer seat provides extra room. 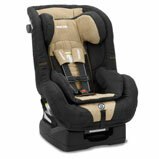 The Recaro Proride is a convertible car seat designed for comfort and style. The safety features of the Recaro are used to protect your child in five vulnerable areas such as the head, neck, pelvis and torso. It comes with a cool mesh ventilation system to keep your child comfortable during the summers. The new Primo Viaggio car seat from Peg Perego offers new safety features such as EPS side foam in the shell and in the head panels. 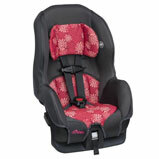 The wide padded seats has a removable cushion for newborns and a quick release 5 point safety harness. The adjustable side impact protection is easy to adjust with 10 different positions to ensure this car seat grows with your child. The Combi Coccoro is a great choice if you have a smaller car and multiple children. It's lightweight and compact which makes it a perfect fit for smaller cars. 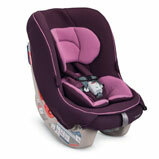 The design of the Coccoro is to accommodate 3 car seats across the back of most vehicles. 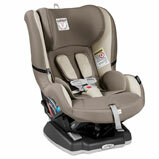 There are many great convertible car seats from different manufacturers. Each year there's a new model with new features but for this year, our pick for the best convertible car seat is the Britax Advocate Clicktight Car Seat. The easy to install and their safety features make it our first choice. 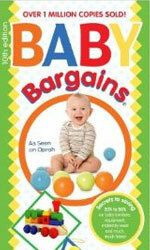 Birth - 12 Months: Children under the age of 1 should always be rear facing. Keep your infant in a rear facing car seat until they reach the upper height or weight limit. 1 - 3 Years Old: If you're using an infant car seat and your baby outgrows it, it's recommended that they still continue to rear face until they reach the maximum height or weight limit of our car seat. After they outgrown the rear facing limits, they may travel while forward facing. 4 - 7 Years Old: After your child outgrows their forward facing car seat, they can travel using a booster seat. 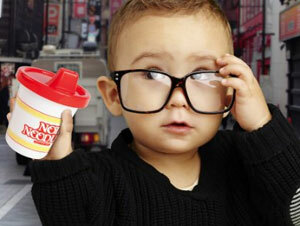 Children should be in a booster seat until they are able to fit into a regular seat belt regularly. Always follow the manufacturers instructions on proper installation and use.